What does the future hold for the field of logistics? How can we best combine human capabilities with those offered by technologies? These are the kind of questions at the heart of the research conducted by the Innovationlab Hybrid Services in Logistics, which is a joint project of the Fraunhofer Institute for Material Flow and Logistics (IML) and the TU Dortmund. The first of the project's two research centres was opened and presented to the public in the middle of September 2017, an event during which visitors were given a first glimpse of the so-called social networked industry of the future. The centre is designed to conduct research into the development of intelligent logistics solutions in which people and technology interact: autonomous vehicles, laser projections, drone flocks and motion tracking with Europe's largest motion capturing system1 make the facility a unique test site for basic logistics research. As a consequence, the facility's construction, as well as the preparation of the subfloor and installation of the wood block flooring in the hall, required the greatest level of care and first-rate products. The facility's solid flooring was, amongst others, created by Kok Parkett from Dortmund in collaboration with STAUF. A sunny Wednesday morning in August in Dortmund. The interior of the modernised research hall is enlivened by the soft sounds of the installers' radio playing in the background, the 530-square metre floor is covered with bottles of STAUF adhesives and stacks of wood blocks ready and waiting to be installed. Kok Parkett's installers started installing the flooring in the middle of July. Four of the installers from Dortmund are busy installing the nearly 20,000 larch flooring blocks, which have been supplied by Parkettwerk Oltmanns & Willms GmbH from Oldenburg. The wood flooring experts first measured the moisture of the smoothed concrete floor – which revealed that some areas were still damper than anticipated. The entire floor was subsequently milled and shot blasted before the wood floor installers applied two coats of STAUF VEP 195 primer and sprinkled the same with quartz sand. The quartz sand is intended to stop rising damp. This was followed by applying the fibre-reinforced SPP 95, which is a cementitious filler and levelling compound that is both easy to work with and apply, as well as extremely strong, and fully cures within 24 hours. Once cured, the floor installers were able to bond two layers of chipboard onto the subfloor using STAUF PUK 446 2-component polyurethane adhesives and screws to bolt them down. These boards act as cable ducts and have been integrated into the hall's entire floor over a total length of 498 metres, which is a time-consuming job. The specialists had built the associated hardwood recesses and 72 covers themselves in advance to ensure that cables can later be easily replaced at any time. The Kok team is working hard to install the wood block flooring, which is considered highly durable and abrasion-resistant. To do so, the installers stretch the flooring elements beforehand, which ensures that the flooring will not leave any marks on the surface. Next, the Kok team applies the STAUF HPK adhesive using STAUF's notched trowel no. 4, which is especially well suited for applying adhesive to wood block flooring. 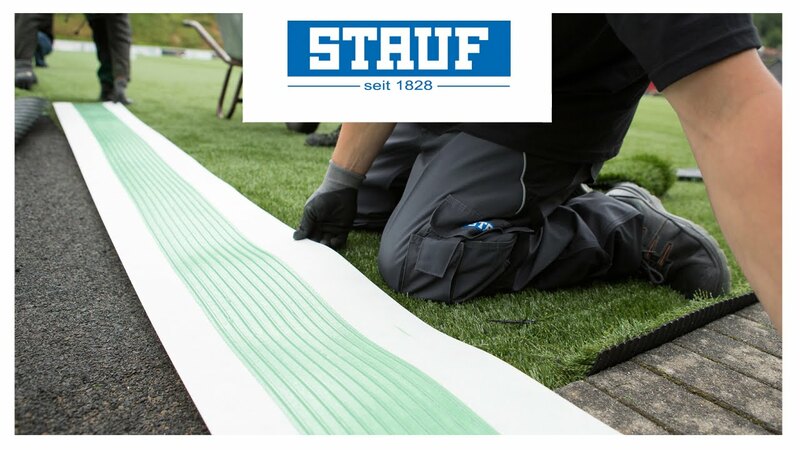 STAUF HPK, a dispersion wood block flooring adhesive, distinguishes itself through a long open time, good wetting properties and is easy to spread – a tremendous advantage when fitting grain-cut timber which, in contrast to horizontal timber, has a much greater absorptive capacity. The individual wood blocks can now be immediately placed onto the adhesive bed from above. The flooring installers press the flooring elements into place and make sure that the blocks are fully wetted. The long open time of STAUF HPK is of tremendous help in this situation. Due to the high level of expansion associated with the use of dispersion adhesives during the first days after installation, the installers have also made sure to leave a big enough gap to the wall. A couple of days following the completion of the installation work, the Kok team sands down the wood blocks and apply a protective coating to make sure that the researchers are always walking on solid ground while performing their work. The innovation lab is currently being funded through a grant from the Federal Ministry of Education and Research (BMBF) worth a total of ten million Euros over three years. According to the project partner, the research initiative is intended to further strengthen Dortmund's pioneering role as a service and logistics location.